Despite the United States' economic abundance, "the good life" has proved elusive. Millions long for more time for friends and family, for reading or walking or relaxing. Instead our lives are frantic, hectic, and harried. 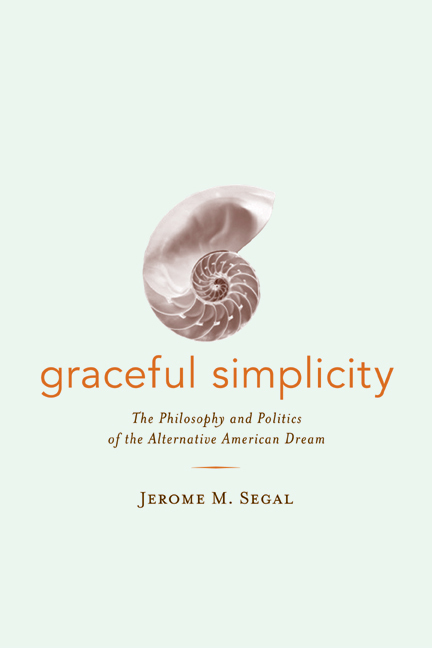 In Graceful Simplicity, Jerome M. Segal, philosopher, political activist, and former staff member of the House Budget Committee, expands and deepens the contemporary discourse on simple living. He articulates his conception of a politics of simplicity—one rooted in beauty, peace of mind, appreciativeness, and generosity of spirit. Jerome M. Segal is the author of Agency and Alienation: A Theory of Human Presence (1991) and Creating the Palestinian State: A Strategy for Peace (1989), and coauthor of Negotiating Jerusalem (2000). He is Senior Research Scholar at the University of Maryland Institute for Philosophy and Public Policy.